With all the recent World Series won by New York Yankees it is easy to forget that New York, the city, was briefly ruled by the Mets in the mid-1980s. With Derek Jeter gone and the Yankees struggling, New York is once again a Mets town. Through the All-Star break, the average Mets game on SNY has drawn an audience of 278,078 viewers, according to the New York Times. That number has more than doubled in just two years and is now 27% more than the average audience for the Yankees on the YES Network (219,205). After years of playing little brother, the Mets returned to the World Series last October and have now become the go-to broadcast of local baseball fans in New York. 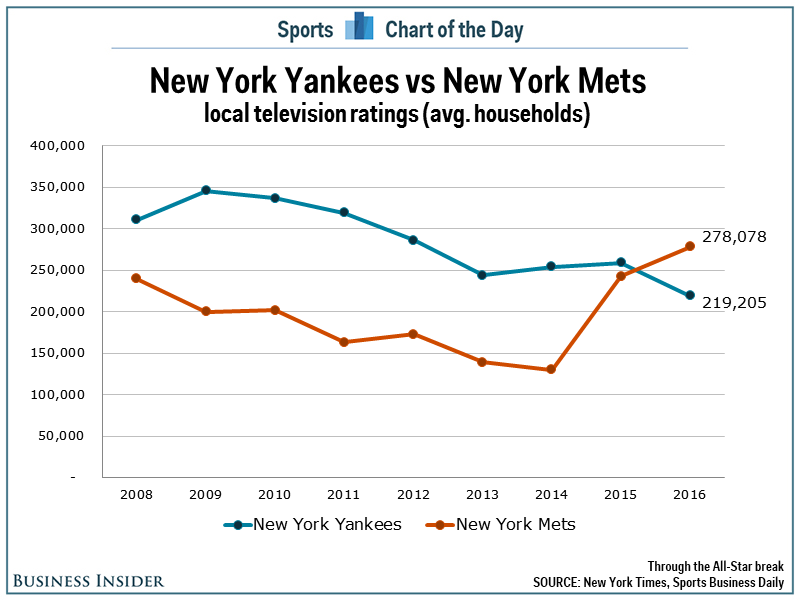 With the Mets making another playoff push this year and the Yankees looking more and more like they are about to wave the white flag and trade key players, this trend is not going to change anytime soon.